This morning, Anna and I rode the NEATO 25 mile Limited Distance Endurance ride at Arcadia in RI. Anna rode Dakota and I rode on Mojo. Since Mojo only arrived on Sunday, this was a bit of a gamble. He has experience in LD rides, but the longest I had previously sat on him was about 45 minutes. We took the horses over yesterday afternoon and vetted them in. 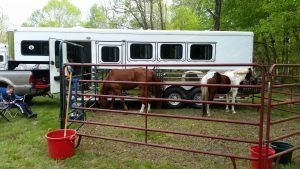 We set up some corral panels that were tied to the side of our trailer and the horses shared the space (Dakota and Mojo get along great). Alex hung out with me at horse camp while Anna took Vicki and Amanda to their music concert. The girls stopped by on the way home to drop off a few things forgotten in the barn and to pick up Alex; I really like the 15 minutes from home rides. I camped over with the horses. This morning, we had a sitter at the house at 6 so Anna could get back to the ride. We tacked up and waited a few minutes to head out after the ride started at 7:15. I had been warned that Mojo tends to be strong and hot for the first few miles. I was pleasantly surprised that he wasn’t crazy, he just wanted to go. We held back some and worked on patience and listening. After the first 4 miles, we had been averaging a 7 mph pace which was faster than we planned. We slowed the horses and made sure we didn’t overdo it. Anna was concerned that Dakota was not as fit as at the GMHA ride last fall. We also had some technology issues. While we love our Garmin 310XTs for tracking distance and speed, we also use them for watching the heart rates on the horses. Today, we didn’t have good connections and Dakota’s heart rate reading was running about 35-40 bpm higher than it should have. There was a lot of discussion during the ride about whether or not Dakota was in distress. 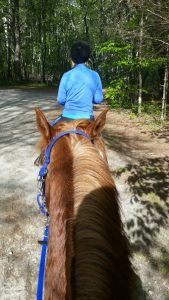 Of course, every time Anna put him in front and let go of the reins, he started trotting at 12+ mph. I voted that he was fine. When we came in from the first 15 mile loop, Dakota actually pulsed down to under 64 bpm (the required level) faster than Mojo. That ended the concerns about his fitness and proved that technology isn’t always great. I ended up riding the second loop without the heart rate monitor recording on Mojo because of the bad data. It is just a distraction that isn’t needed and I think Anna and I are both going to shift to using heart rate as an occasional training tool, but compete without it. Maybe. After our 45 minute hold we headed back out. We ended up averaging about 6.2 mph on the first loop which was fine. We took it easy on the second loop of 10 miles. In the end, we completed the 25 miles with a ride time of about 4:15 and averaged just over 6 mph. Both horses cleared the vet check at the end and were deemed fit to continue, which is the criteria to be awarded a completion. Mojo and I had a good ride together. We have a few things to work on, such as personal space. Mojo likes to be in my space and stood on my feet more than once. He also likes to use me (and Dakota) as a scratching post for his head. Despite these minor things, he moves out very nicely on the trail and has a powerful trot. He had no problem holding a trot up to 12+mph. I do have a few things I want to change before another distance ride. Anna and I have both been somewhat unhappy with the halter/bridle combos we bought last year. She has recently switched to using a rope halter and adding a basic trail bridle. I think I’ll be making the same change. 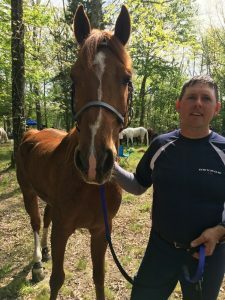 Also, I got a few rubs from my clothing (like sock tops on my calf where the calf and saddle touch) that require fine tuning before going up to any longer distances. In the end, it was a good ride, but now we have to get ponies ready for the kids to show tomorrow!